We are a cleaning company based in Europe named "[login to view URL]". we started our company 20 years ago, with the name bee cleaners. once we changed our name, our logo still contained a "bee" in the logo. So now we want to make a new fresh and professionel logo, but somehow keep the "Bee" and the shape behind in the logo, but in a professionel way. So people can still remember us and our historie, but the new logo will be professionel and grafical high standard. if you have some better idea to the logo, then upload the logo and give us the reason why you made that, and we will look at it. Guys! We have extended and updated this contest, we have uploaded our current logo, and are looking for the same type logo and shape, just where there is minor changes. we don't like the bee, that we want to be updated, but still keep the background shape - reason is, we have printet a lot of stuff, and we don't want change all this because of new logo. so we want a new fresh updated logo, but still not so much different. the color combination green and yellow is a problem, so you can try some different variation, but remember keep the green. and the bee we don't like, so please some how minimize that, but still it should be a bee. > If you are planning any copy/paste logo then just forget to bid, as we are looking for a unique design. I HAVE A UNIQUE DESIGN MADE MYSELF. MADE IT BUT THERE IS NO OPTION TO SUBMIT? CONTACT ME WILL SEND YOU. This is a logo that you can use separately or together, your customers can recognize it. please check my updated entry #251 . Please check entry #210 #213 #215 . Thank you . 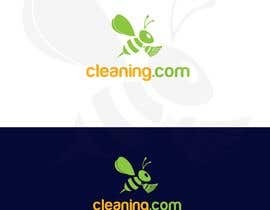 the name "cleaaning.com" or " cleaning.com"?